I took this picture on a quiet bank holiday afternoon so whilst not many people are in this picture if you stand here during a weekday rush hour you'll see a stream of people cycling along here. In fact, if you stand here any time of the day or night you'll see people on bikes vastly outnumber people in cars. It's not hard to see why when you look at the surrounding area on a map. The road in the picture above provides a direct and quiet route from London fields through to Islington whereas if you wanted to drive it would take longer and is much less direct. It's the motorists that are inconvenienced, whilst everyone on a bike gets the most direct route. There is no need for protected space for cycling here as there is virtually no motor traffic on these streets at all. Only residents or people visiting residents drive down these streets, and they tend to drive at low speeds as well. 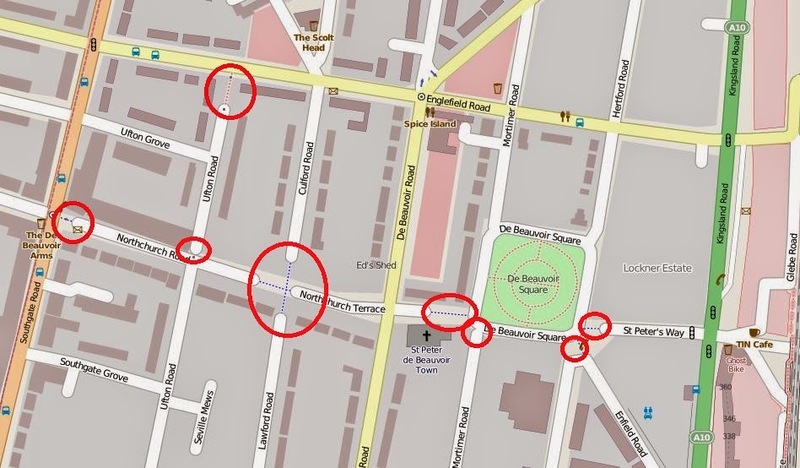 There is no "banning" of motor vehicles here though, every single address can be accessed by motor traffic. Almost all properties have ample car parking, three or four off street spaces in some cases. It's also clear from looking at both the make of cars and the price of property that most here are not short of money. It doesn't really come as any great surprise that living in such a quiet and pleasant place close to Central London is a desirable place to live. A shame I can no longer afford to live there. It's not just people on bikes who benefit either. I remember walking to The Scolt's Head through the junction above during the snow in early 2012 and kids were out building snowmen, right in the middle of the road. One of the very few roads in London where they were able to do this. Here is another closure to the west of De Beauvoir Town where the boroughs of Hackney and Islington meet at Southgate Road. They didn't have that nice looking bike path in the distance when I lived there, it was just a shared pavement. Although that "Cyclists give way" sign is new and I don't really see why they installed it to be honest. Two people using the same bike is something you see everyday in the Netherlands but is a rare sight in the UK. I used to give my flatmate a "backie" when we cycled back from the Scolt's Head in an evening but only because we lived in De Beauvoir Town. 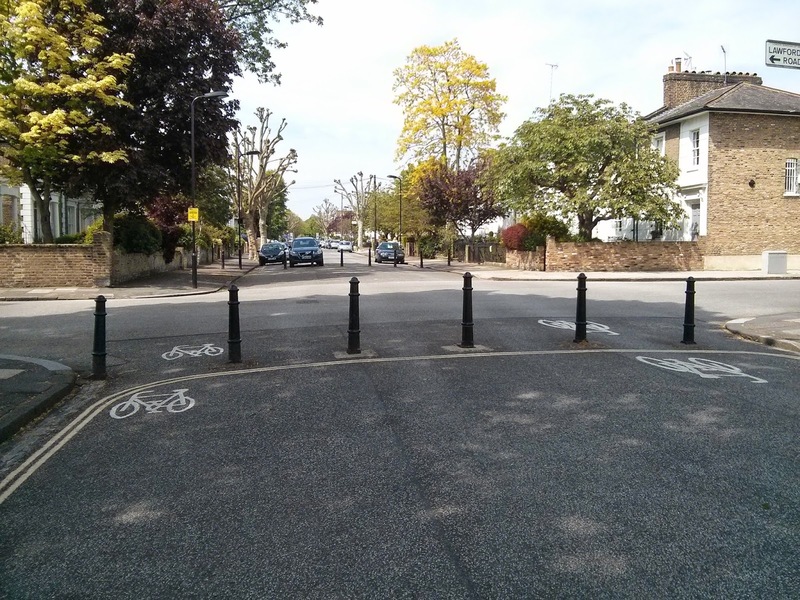 Whilst this is now a major route for people cycling it wasn't planned that way. These road closures were pushed for by the local residents association decades ago, sick of all the rat running through their streets. A byproduct of these closures was the cycle routes and the safe places for children to play; truly living streets. It's quite remarkable that just a handful of road closures changes the entire area and streets just a few blocks away are crammed with rat running traffic all day long, along with low cycling rates. 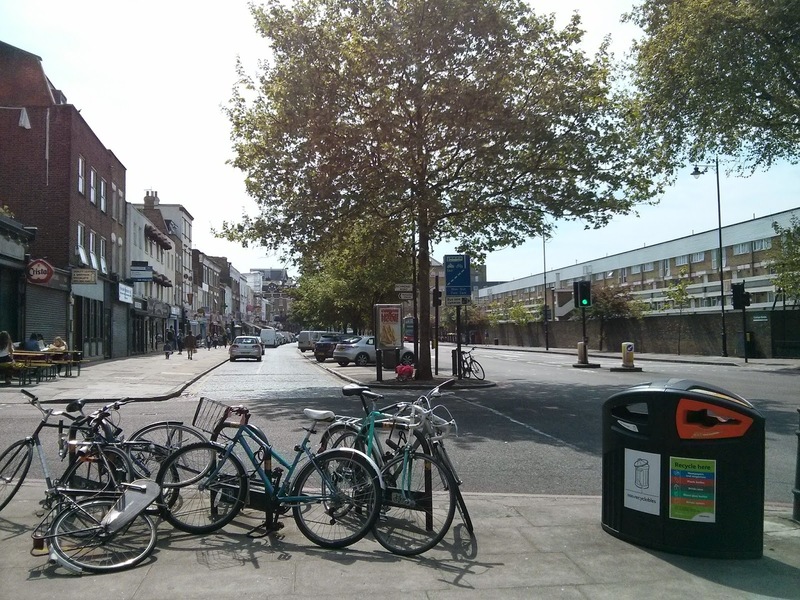 This space for cycling doesn't last long though, De Beauvoir Town, along with places like Goldsmith's Row and London Fields are just small isolated parts of Hackney that are marvelous places to cycle surrounded by horrendous places to cycle. The A10 runs alongside the east side of De Beauvoir Town but has no space for cycling despite the absurd amount of space. Meanwhile Hackney council are blocking any plans on putting a cycle superhighway down the A10 as there just isn't the space. Instead they are pushing for "quietways" alongside, so whilst motor traffic gets a straight and direct route through the heart of Stoke Newington and Shoreditch people on bikes have to take a longer, piddly route along back streets. The council are pushing for 20mph limits on the A10 but if you've ever cycled along Camden High Street or Clerkenwell road then you'll know that even if you paint "20MPH" in massive ten foot long letters on the road most will not will stick to it. Not even TFL bus drivers or the police themselves. So I'm afraid you'll have to carry on cycling down here amongst fast moving buses and lorries and past Antony Smiths ghost bike to access De Beauvoir Town until the council change their mindset. If you want to try and help improve cycling conditions then there is a space for cycling ride in Central London this weekend. Whether cycling round closed off streets with thousands of others will actually achieve anything is another matter. It might make the next mayor decide to focus more on cycling when his or her term comes and finally build segregated cycle lanes on London's main roads. Or it might not but it is worth a try. 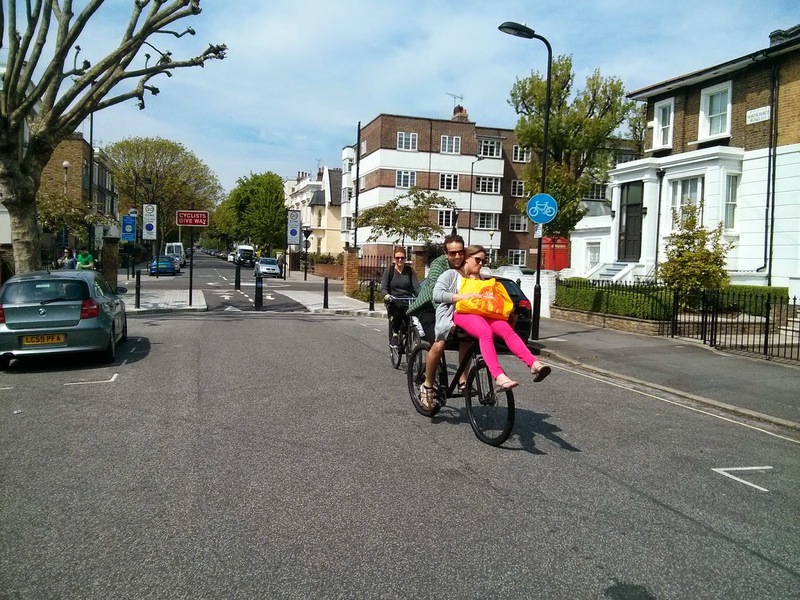 Perhaps if you get together with your neighbours and you all decide to approach the council as a recognised residents association then perhaps you too could close roads in your neighbourhood, creating space for cycling and streets for kids to play in. They might not agree but it is worth a try.